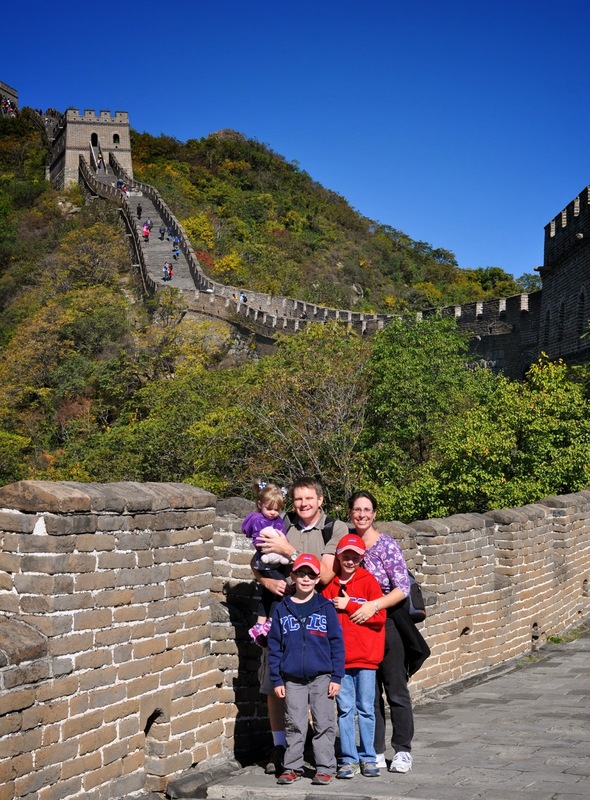 One of the things I have wanted since before arriving in China is a picture of the 5 of us on the Great Wall. 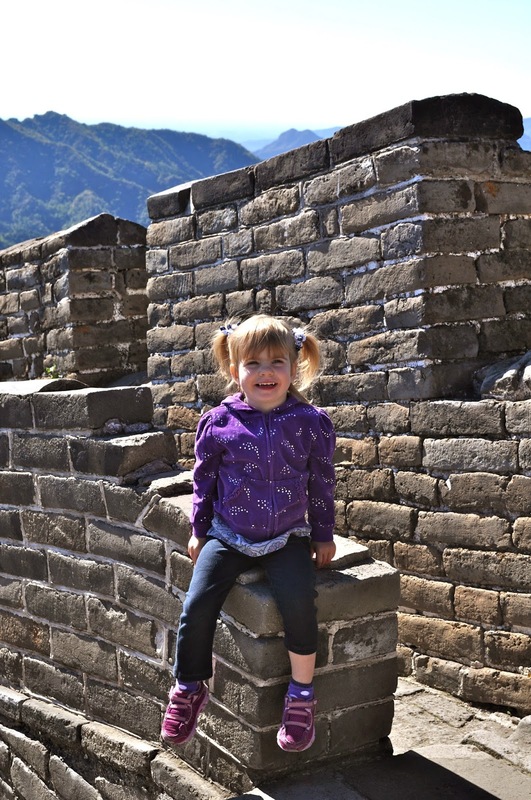 The first time I visited the Great Wall, I was bowled over. It is beyond impressive. It is immense and imposing and incredible. It is a sight to behold. My first visit was on a nasty day, one of the only days it snowed last winter. It was cold and gray from pollution and bad weather. But, still, the Wall was not disappointing. I climbed on it despite it being slippery and treacherous. There were no warning signs or park rangers, you climbed at your own risk. 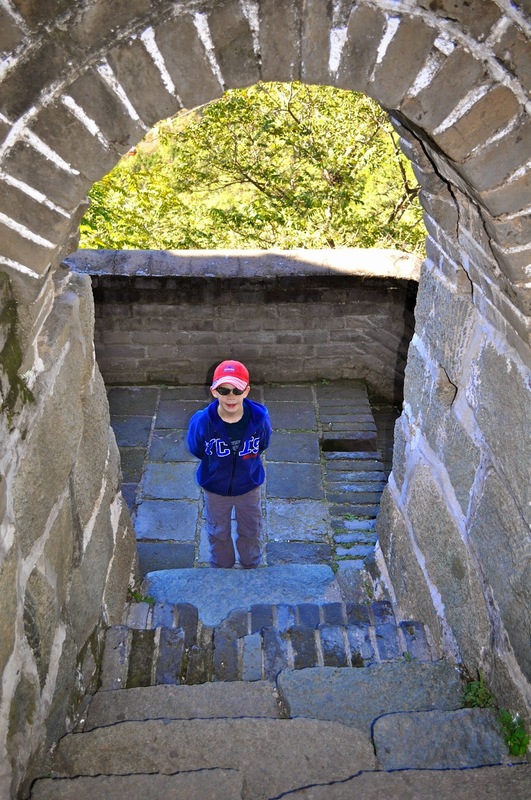 I was with my dad and he was determined to say he had climbed the Great Wall, and so he did. But, I didn't want to take the kids on a day like that, they would have been miserable, all of us would have been miserable. 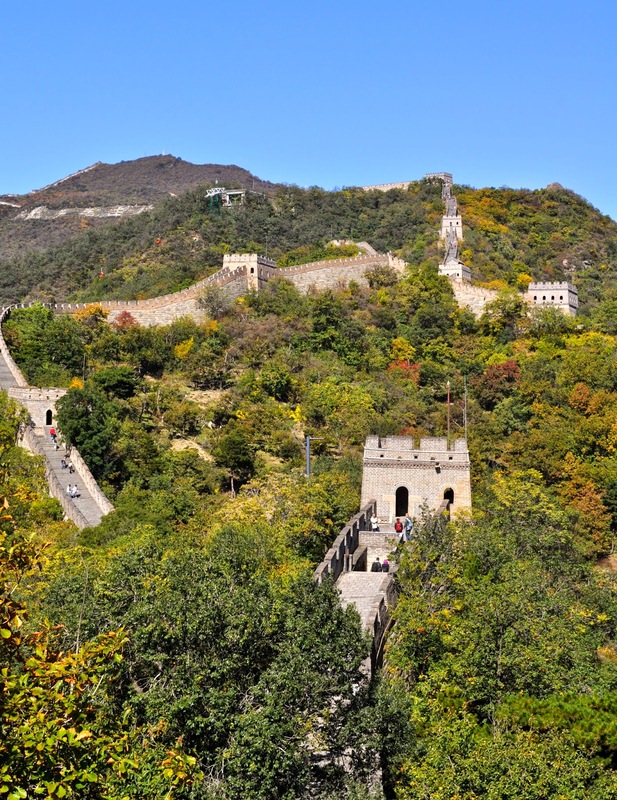 The Wall is only about 40 miles from downtown Beijing, but in traffic, that 40 miles can take hours. And, as you might imagine, it is a popular tourist attraction, and not just for foreigners. Just like Americans, Chinese citizens come from far and wide to see the beauties and wonders their country has to offer. And, just like in America, during the holidays, the number of tourists goes up exponentially. On Chinese holidays, millions, literally, of Chinese converge on Beijing visiting all the famous (and not so famous) sites. You don't want to be anywhere near a tourist attraction on a Chinese holiday -- we've done it, we know. After we moved to Beijing, I realized I didn't just want a family photo on the Wall. I wanted a photo of just us, no random tourists in the background. I wanted the photo on a day with blue sky and when the air was breathable. After our first winter here, I realized with those parameters getting a picture was going to be more than a little challenging. However, I was determined, so we made a plan. We decided the next time the stars aligned (i.e. good weather, low pollution, not a weekend or a local holiday, coolish (because you are completely exposed to the elements up there), and, if we were really lucky, a US holiday so Kenny was off), we'd take the kids out of school, brave the traffic, and, hopefully, get our picture. Yesterday was Columbus Day and much to my delight all the elements needed for a great day on the Great Wall came together. The kids played hooky, we made sandwiches, donned jackets, filled water bottles, lathered up with sunscreen, and off we went. It was an absolutely perfect day. Perfect. In fact, I don't think we could have asked for a better day. The sky was blue and clear - we could see all the way to central Beijing! There were some tourists, but not too many. The air pollution was almost non-existent, a miracle in and of itself since it had topped 450 the three days before. The traffic was reasonable and it only took us 90 minutes to reach our destination. And, most miraculous of all, the kids had a great time and were really cooperative. 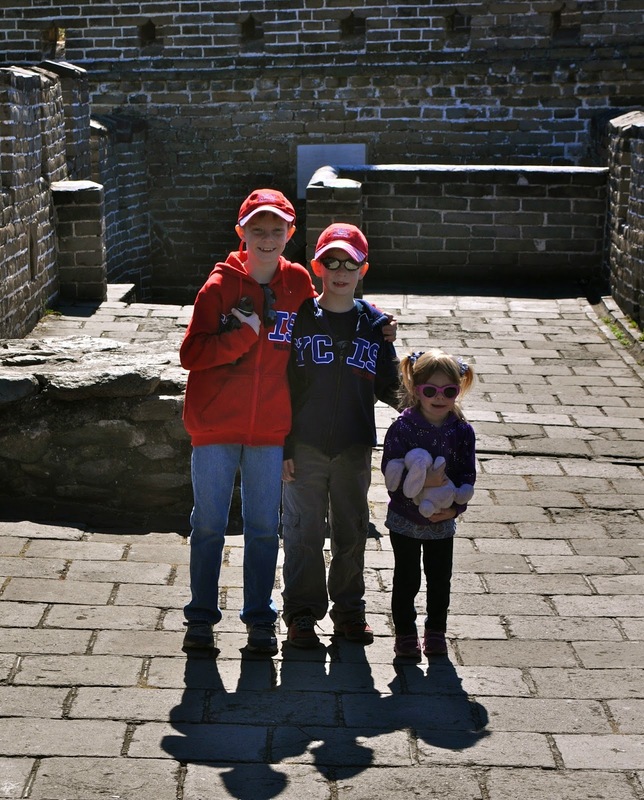 It was Claire and Isaac's first trip to the Wall and our first as a family. After living in China for 21 months, I finally got my picture, and then some. 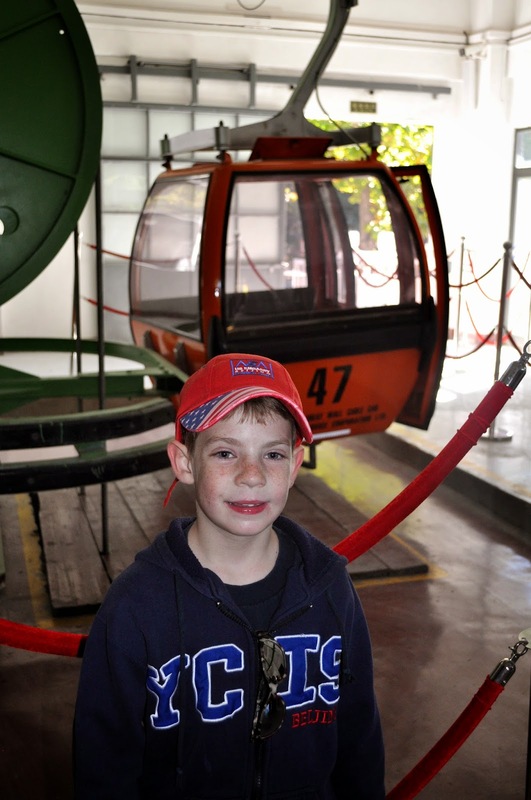 We took the cable cars up -- yes, we're wusses, we did not climb. So happy to be there. Even Claire was smiling for the camera. 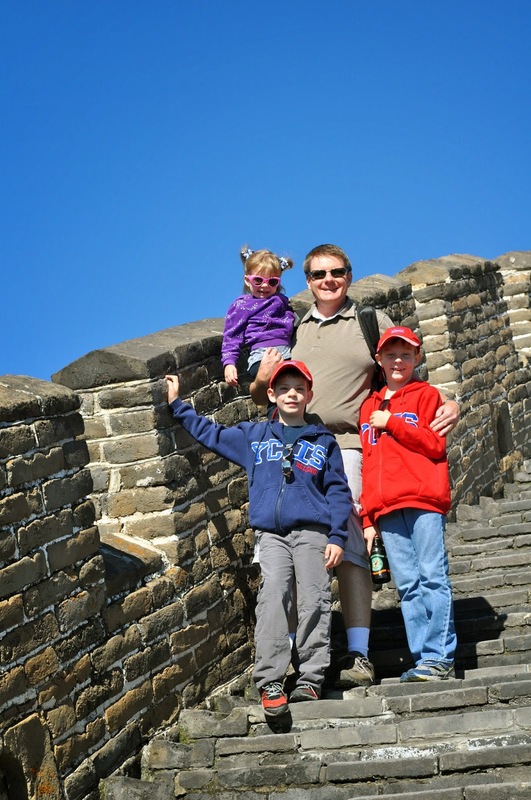 Family photo on the Great Wall of China. Huzzah! It was just chilly enough for jackets. if there is a next time, I think we'll try to hit a section of the wall that has not yet been restored. Just us and the Great Wall. My kiddoes enjoying an unexpected day off. Lots of fun entrances and passageways to explore. Come visit, we'll take you to see it! 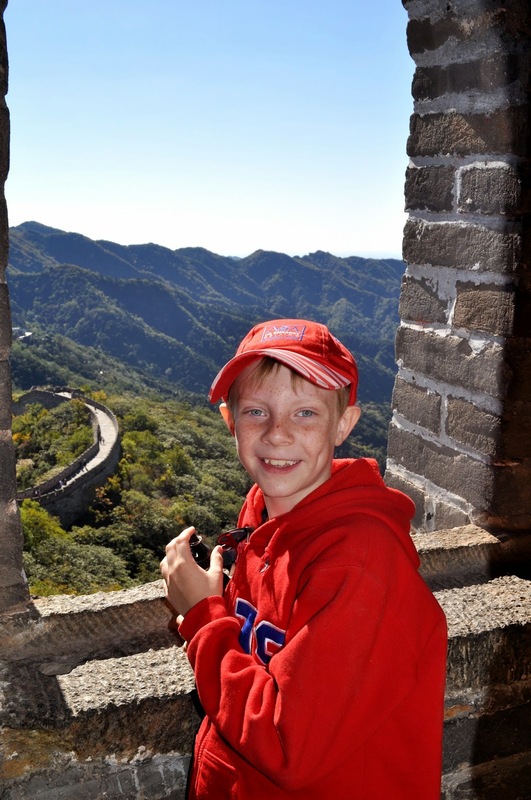 Hanging out on the Great Wall. We took the Toboggan down, super fun! That's us on the Great Wall of China - WOW! The sky is so blue! Glad all the stars aligned! Who snapped the awesome money shot?? love love love!!! And I love that you planned this, because perfection is not spontaneous! !